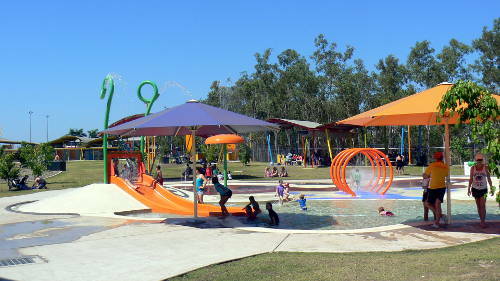 The Palmerston Waterslide and Skate Park provides free access for kids of all ages to enjoy some great recreational activities. Access to the park is a little tricky, there is no vehicle access directly from University Ave. As the map below shows, the turn off for the main car park is at the traffic lights on the corner of Yarrawonga Rd and Roystonea Ave.
Alternatively use the tunnel under University Ave to walk from the bus station or car parks along Chung Whah Tce. 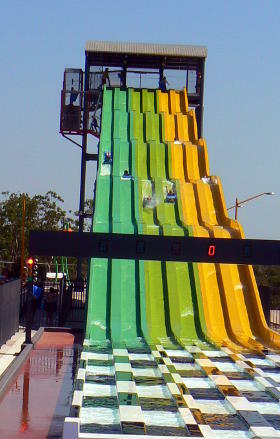 14 metre high Palmerston Waterslides Six lanes set up to allow racing, with the results shown on the black electronic display which spans the splash pools. 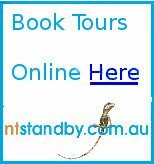 Schools and other groups must book at least two weeks in advance to help ensure an enjoyable and safe visit. Water Bucket dumps it's load. 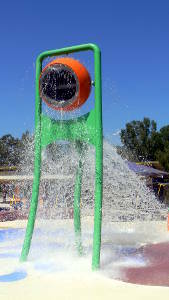 Younger children are catered for with small pools and water games and some shade. 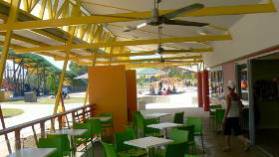 Shaded areas and BBQ plates help make this an all round family recreation area. It's an ideal place to bring family and friends for birthdays or just a day of fun and games.